Gumoil printing - the method for producing photos in gumoil technique. Gumoil printing was introduced in the 90th of the last century by American photographer Karl Koenig. Gumoil or Gumoil printing is the method for producing photos with gum, chromium salts and oil paints. It's painstaking and very expressive photographic method that combines unique author's point and documentary photography. Through the use of materials for art works - cotton paper and oil paints, archival photos have unique properties that are comparable to paintings on canvas. Nevertheless, Gumoil print is the alternative photographic process. Print photos in Gumoil technique requires a positive image printed on the film. 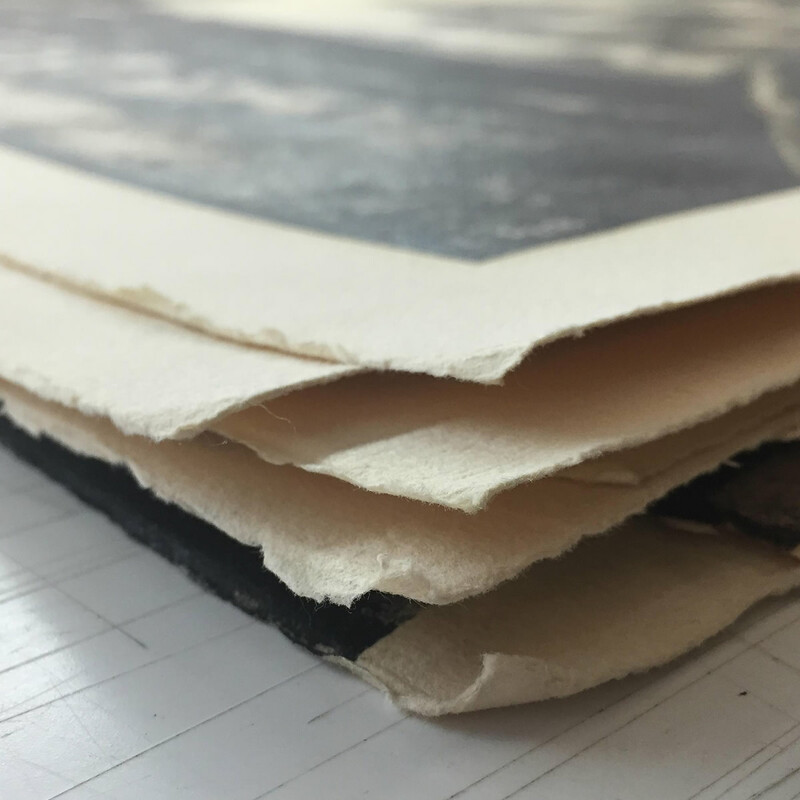 In dense cotton paper is applied and dried light-sensitive solution of gum arabic and bichromate. The image is exposed by contact under UV or halogen light. Under the rays of light chemical process takes place and turns to the visible image. Paper with solution is washed with water until bichromate finally removed. Then the paper is dried. Next to the paper with the image oil paint is applied. The paper is placed in to the water and the upper layer of paint is erased. Do not use any additional reagents or chemicals other than those mentioned above. Pictures are not bleached with chlorine. All what is necessary for a successful process is quality paper and oil colors, properly selected chemical composition and faithful exposition. Such paintings erase time. Simple stories become like an old engraving or pencil drawing. Yet this image is getting with the help of the photographic method using a light-sensitive emulsion and oil paints that gives the process a special noble. The work that the photographer spends on getting the end result gives the picture special properties. Handmade Gumoil prints are unique. It is impossible to make an exact copy of your photo, just as it is impossible to paint an identical pictures on canvas. Gumoil is creative and picturesque printing method. Author gets complete freedom to interact with objects in the picture, through the oil, light and shadow. Photographer is showing on paper his attitude to the object and the message to the public. The main thing about the final image is the love of a handmade pictures. It is the call to evaluate not only the beauty and harmony of the picture, but also a special, hand-made way to get it. It is important to emphasize the special feelings that the viewer experiences looking at the handmade photography. The nobility of the materials together with a properly selected story line make a wonderful harmony. Hand made print allows you to feel the value that keeps the warmth of the offers hands. In this section, I will answer basic questions about Gumoil printing process. These questions are asked most often. You can also send me your own questions. For several years I have been working hard over the Gumoil printing photos. I improved the technique which had been created by the author Karl Koenig. I got rid of the chlorine elements, which strongly influenced the properties of archival photographs and replaced UV light on a halogen light, which gave deeper tones of the image. Instead of potassium dichromate is used less carcinogenic ammonium bichromate. The picture can be printed in just one layer, that saves expensive oil paints. The imprint is not necessary to retouch, it is well detailed. The process has become easier, faster and less harmful to human health and the environment. Photos created with the help of my experience have differences with original method. 1. Photographic equipment used for shooting. Gumoil printing requires high quality images. Therefore, for the shooting I use Leica M Monochrom camera, Leica S 007, cardan camera 5x7 and 11x14 field camera. I do not recommend to use a monocle and a pinhole. 2. Selection of the subject. In my opinion for the Gumoil method are more suitable scenes filled with lots of details. It visually strengthens the relief image. 3. Processing and printing of positive / negative. To Print the photos I take plotter Epson Stylus Pro 9890. The image is printed on the Pictorico Pro Ultra Premium OHP Transparency film. Most often I use a monochrome camera. Settings allow you to do the right image suitable print quality. No further processing is required. The photo must be sufficiently clear and fine contrast. I like to print on an English paper cold press Somerset and Stonehenge. Paper can be textured, satin or velvet. It fits any, but the results will be different. You can print on any other thick paper. An important condition is acid-free and good paper weight. The photosensitive solution was made from a mixture of ammonium bichromate and gum arabic: 1 part bichromate for 2-3 parts of gum arabic. Bichromate solution 13%. Gum arabic can be used in ready-made solution or you can do it by yourself: 1 part dry gum arabic for 3 parts of water. The process requires a safelight. 6. Cover the paper with a solution. Drying. Paper is coated with a uniform layer of light-sensitive solution. This can be done using a wide brush or roller. Layer solution must be completely dry without light. 7. Exposure. UV / Halogen. The exposition takes place under UV or halogen light. If the halogen lamps have safety glass, it must be removed. Exposure time should be evaluated individually. It depends on many parameters: Lamp power, the distance from the light source, the thickness of the photosensitive layer etc. The average exposure time is about 10 minutes. 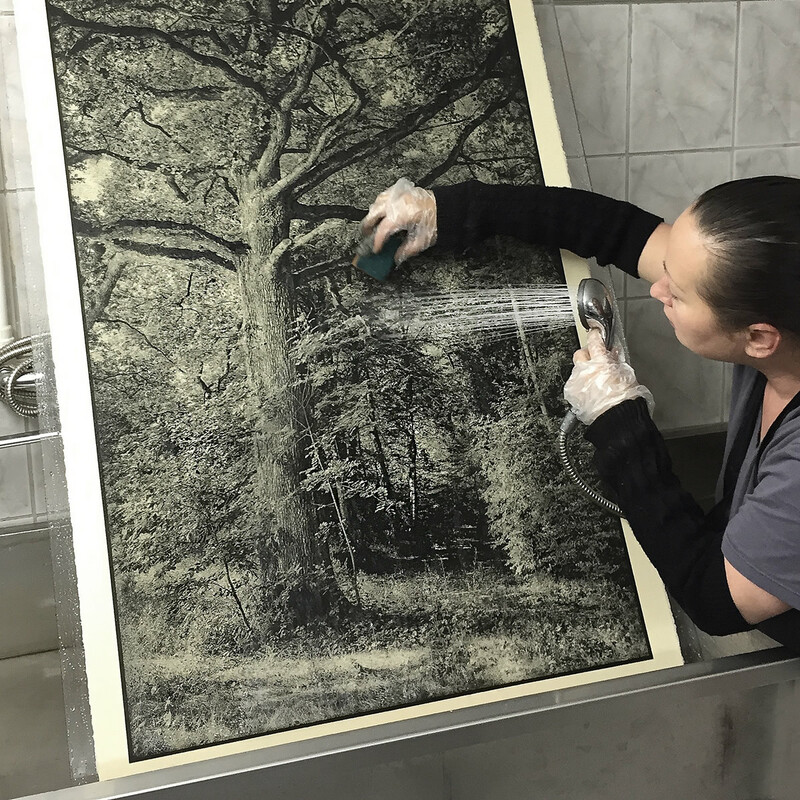 After exposure, the paper is placed in a bath of water at room temperature to remove the bichromate. 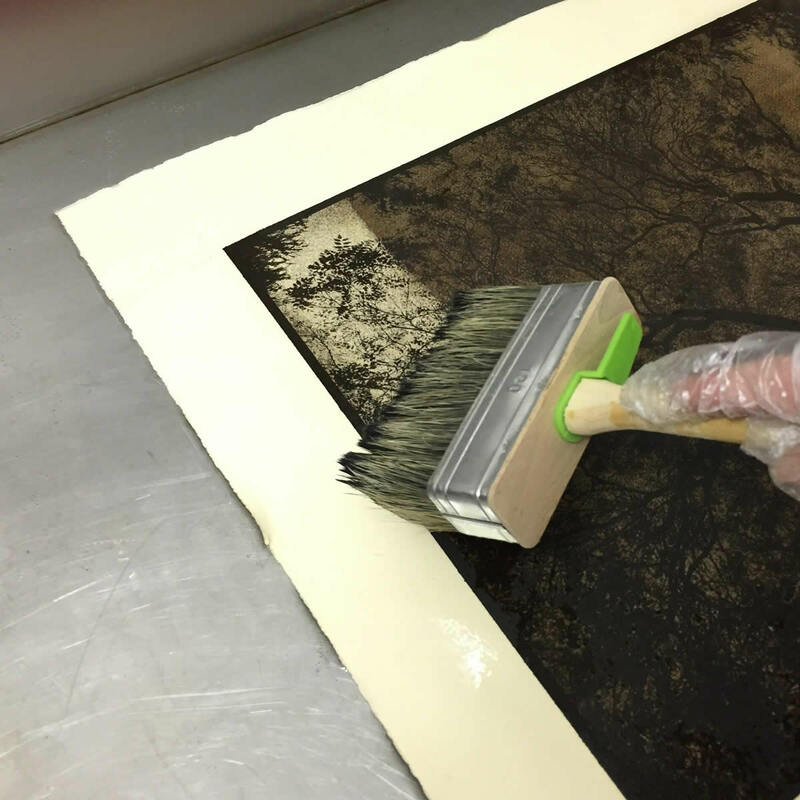 After the bichromate will wash out off paper, it is necessary to hang it and dry thoroughly. 9. The choice of oil paints. You can use any oil-based paints. It is better to work with a good quality paints. My favorite brand is Maimery Classico and Lucas in 1862. 10. Cover the paper with paint. Paper with a barely visible image is completely covered with oil paint. This can be done with a brush, with a soft cloth or soft paper. You can wait a few minutes until the paint is absorbed, but it is possible to continue the process immediately. The filled paper is placed in the water and the top layer of paint is washed off. This should be done gently, without damaging the lower layer of the image. You can use a brush, sponge or cloth. Pictures are stored in folders, separated by sheets of tracing paper. Or installed in the frames.